A few thoughts on Rosé Wine: The Guide to Drinking Pink by Jennifer Simonetti-Bryan. Jennifer Simonetti-Bryan earned her Master of Wine in 2008, becoming the 4th woman in the United States to achieve such a distinction. In the introduction of Rosé Wine, she describes the difficulties in finding resources on rosé while she was studying for her MW and with rosé growing in popularity (particularly in the US), this book fills a niche. The book is broken into 3 sections with 10 chapters. The first part, “Getting Started”, covers the basics of making and tasting rosé and concludes with Chapter 3’s presentation of Simonetti-Bryan’s 10 question Rosé Quiz. This quiz, which features questions asking about coffee habits and whether you put lemon juice on your green beans, aims to identify what style of rosé you may enjoy based on your tolerance of bitter, sweet and sour components as well as alcohol heat. The next section of the book goes into the world of rosés with chapters 4 through 7 detailing the four broad categories of rosés–Blush wines which emphasize sweetness, Crisp wines which emphasize acidity, Fruity wines which emphasize fruit and Rich wines which emphasize body, alcohol and deep color. In each section, Simonetti-Bryan gives specific wine recommendations that exhibit these particular styles and food pairing options for them. The last section, covering chapters 8 through 10, is titled “Resources” and includes more in-depth food pairing guidelines as well as a pronunciation guide and checklist for the wines featured throughout the book. I must confess that when I picked up this tiny (6.5 x 8 inch) book, I wasn’t expecting much. I mean, come on, it’s about rosé! Outside of knowing which grapes grow in which wine region that makes rosé, how much is there to really know about it? And truthfully, it’s often easier to find rose Cava in the US than Spanish rosados. I got schooled by the Jedi Wine Master. The first eye-opener for me came on page 2 when I learned that after France, Spain is the second leading producer of rosé. Spain?!? I know they make a significant quantity of wine but I would have surely pegged the US as #2 for rosé production–especially since we drink so much of it. But then, my US-centric experience is at play when I can find dozens of American rosé examples but only a handful of Spanish rosados on restaurant wine lists and store shelves–a Muga here, a Marques De Caceres there. 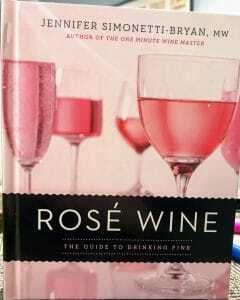 In Chapter 1 on “Making Rosé”, I geeked out on the varietal characteristics of the grapes. As someone who is toiling away on the WSET Diploma level, it’s helpful to know little blind tasting hints such as looking for herbal notes like oregano in Sangiovese, the raspberry flavors in Syrah rosés and how Mencía can come across like Malbec but with more blackberry, violet and spicy flavors. I also never realized how much co-fermentation of white and red grapes was done in rosé winemaking. Typically when you think of co-ferments, you think of notable examples like Syrah and Viognier in Côte-Rôtie and field blends. But littered throughout Rosé Wine are examples that Simonetti-Bryan highlights from regions like Vinho Verde (10 different red and white grapes can be used), Veneto (the Prosecco grape Glera with red grape varieties), Rioja (Viura and Tempranillo) and Tavel. I was also surprised to learn that Pink Moscato is usually made with blending red wine to white Muscat blanc wine. I always thought it was made from one of the countless red skin variations of the Muscat grape. In Chapter 2 on “Tasting Rosé”, Simonetti-Bryan’s explanation of picking up flavors via your retronasal cavity is one of the best I’ve ever came across. She asks you to think about how you can taste food that you ate hours ago when you burp and that is bloody brilliant. Gross, but brilliant and I’m totally going to steal that the next time I have to explain retronasal olfaction. Here Simonetti-Bryan gives a smorgasbord of options with each rosé style getting 15 to 22 recommendations of specific wines to try. I found a couple dozen that excited me but I’m going to limit this list to the top 5 that interested me the most. Domaines Ott Clos Mireille Côtes de Provence Rosé (Crisp style) – I can’t imagine myself paying nearly $50 for a rosé but Simonetti-Bryan’s description of this wine having a long slow fermentation, spending 8 to 12 months in vats, makes this very fascinating. Domaine la Rabiotte Coteaux d’Aix-en-Provence (Crisp) – At around $13, this is more in my wheel house for rosé and the description of this wine’s minerally acidity cutting through the fat of pulled pork had my mouth watering just thinking about it. 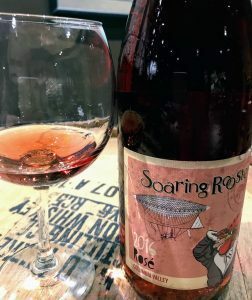 Conundrum Rosé (Crisp) – Made by the Wagner family of Caymus fame, this rosé is made from the uber geeky Valdigué grape. That right off the bat had me interested but then Simonetti-Bryan notes that the grapes are apparently “rolled” for 3 hours before pressing. Rolled? I’ve never heard of that before. By hand? By machine? In a tumbler barrel? I’m intensely curious. Domaine Clarence Dillon Clarendelle Rosé (Fruity style) – Made by the Dillon family of Ch. Haut-Brion fame, a sub $20 Bordeaux rosé made from Merlot, Cabernet Sauvignon and Cabernet Franc sounds delicious. I’d also like to see how the time spent aging on the lees impacts mouthfeel. Château de Ségriès Tavel (Rich style) – Located across the Rhône river from Châteauneuf-du-Pape, the Tavel AOC specializes in producing deeply colored and fuller bodied rosés. I also liked Simonetti-Bryan’s tidbit that this AOC only produces around 500,000 cases a year–which she compared to Barefoot’s annual production of 17 million cases. With all the food pairing tips she gives for matching rich, robust rosés with heartier fare, I think I’ve found a way to enjoy rosés in winter. Unfortunately Simonetti-Bryan didn’t include an appendix of notes or reference section in Rosé Wine so I didn’t get as many recommendations for future reading materials as I have from other wine books (like Bursting Bubbles). She does name drop a few potentials in the book–including two in the Introduction as she recounts a sommelier at a Michelin-starred restaurant humorously telling a Master of Wine that “rosés are not wine”. But I was so impressed with Rosé Wine that, when I was finished, I went to Amazon to look up other books from Simonetti-Bryan that I could add to my reading list. As I noted above, I wasn’t expecting much from this book–a quick read and maybe a takeaway or two–but I ended up burning through a highlighter. The fact that Simonetti-Bryan could jam so many usefully nuggets of info, and present it so unassumingly, is a huge testament to her skill as a teacher. Throughout reading Rosé Wine, I found myself continually surprised and presented with new ways of thinking about something. While I initially eye-rolled at the Rosé Quiz and usually chafe at such over-simplification of people’s tastes (like I hate coffee and spicy food but love bitter dark chocolate and spicy, tannic, full-bodied reds), I was thoroughly impressed with her explanation of her methods and will have to admit that she nailed me as a Crisp rosé girl and my wife as Fruity rosé fan. While on the surface it seemed overly simple, the thinking and methodology behind it was solid. I can see the full-bodied weight of this Counoise rosé from Washington pairing well with heavier fare. I was also impressed with how Rosé Wine encouraged me to rethink my food pairing approach with rosés. I’m so nearsighted about matching weight to weight (light bodied rosé with lighter fare) that it was surprising for me to see Simonetti-Bryan’s recommendations of lamb with a Merlot and Malbec rosé from New Zealand, rich octopus with a Tuscan rosato and beef brisket with a Cabernet Franc rosé from Israel. None of those pairings would have been my first instinct for those dishes or wines but after reading Rosé Wine, I see how they make sense. And I honestly can’t wait to try them. Tagged Amazon, Barefoot, Benjamin Lewin, Bordeaux wine, Bursting Bubbles, Cabernet Franc, Cabernet Sauvignon, Cava, Caymus, Château de Ségriès, Chateau Haut-Brion, Châteauneuf-du-Pape, co-ferment, Conundrum, Côte-Rôtie, Coteaux d’Aix-en-Provence, Côtes de Provence, Domaine Clarence Dillon Clarendelle, Domaine la Rabiotte, Domaines Ott, food pairing, French wine, Glera, Israeli wine, Jennifer Simonetti-Bryan, Ken Arnone, Malbec, Marques De Caceres, Master of Wine, Mencía, Merlot, Michelin, Muga, Muscat, New Zealand wine, Pairing with the Masters, Pink Moscato, Prosecco, Provence wine, retronasal olfaction, Rhone wine, Rioja, rose, Rosé Wine, Sangiovese, sommelier, Spanish wine, Syrah, Tavel, Tempranillo, The One Minute Wine Master, Tuscan wine, Valdigué, Veneto, Vinho Verde, Viognier, Viura, Wagner family, Wine Myths & Reality, Winemaking, Wines of France, WSET Diploma.